Description: ATLANTIC OCEAN (May 18, 2009) Deck department Sailors aboard the amphibious dock landing ship USS Fort McHenry (LSD 43) bring across a fuel line while conducting a refueling at sea with the amphibious assault ship USS Bataan (LHD 5). Fort McHenry is on a scheduled deployment with the Bataan Amphibious Readiness Group Supporting maritime security operations in the U.S. 5th and 6th Fleet areas of responsibility. 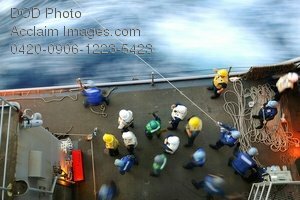 (U.S. Navy photo by Mass Communication Specialist 2nd Class Kristopher Wilson). Stock photography by Department of Defense Public Domain.